special district selection committee. 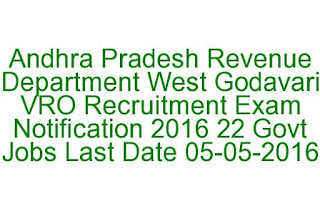 These vacancies are reserved for the Scheduled Agency Area of Khammam Schedule Tribe candidates. For kukunoor village reserved for General Category (All West Godavari District candidates are allowed for this). For more details please see the information given below. 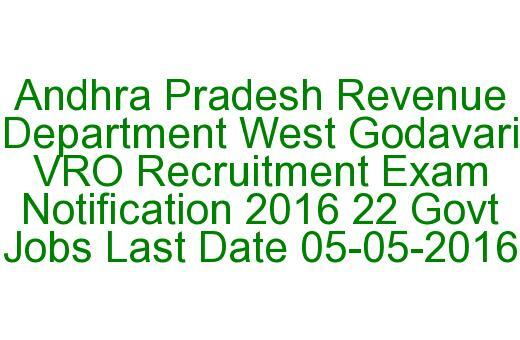 There are total 22 VRO vacancies available in West Godavari District Scheduled Area of Khammam. Must have qualified intermediate exam from Andhra Pradesh Board of Intermediate or any other related qualification. Age limits for General candidates 18-40 years and for ST candidates 5 years of age relaxation, PH candidates 10 years, Ex Servicemen 3 years of age relaxation is given. The Selection of candidates is based on objective type Written Test for 100 Marks at Intermediate level.